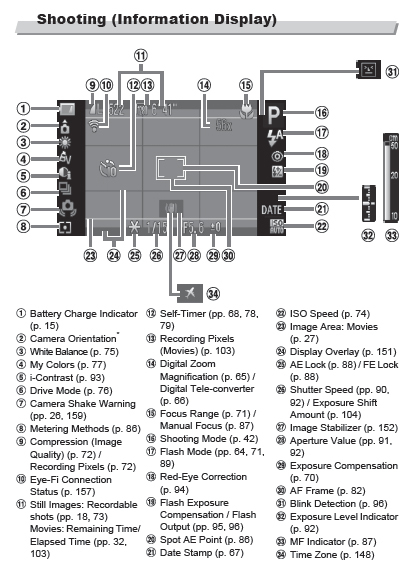 Just about every digital camera manufactured these days has a big, bright LCD display. It’s there for a reason, you know, and it’s not just to let you see what you’re shooting (a viewfinder is better suited to that task, although most compact cameras don’t even have one, but that’s another story). No, the LCD display can give you an abundance of useful information, both before and after the shot. So much information, in fact, that you shouldn’t be too surprised when you finally get around to transferring them to your computer. To illustrate what I’m talking about, I downloaded a user manual from a mid-range Canon point-and-shoot camera, the PowerShot SX210 IS. This camera has a really nice 3.0 inch TFT LCD display. Sure, your cat looks cute in this display, but let’s have a look at what else it can tell you. Number 7 (camera shake warning) – This indicator tells you that you’re probably going to have a blurry image unless you use a tripod. Number 14 (digital zoom magnification) – I already told you here what I think about digital zoom, so you’d better not be using it. Number 28 (aperture value) – Click here for a refresher on what this number means and how it relates to what you’re trying to photograph. Number 4 (ISO speed) – This (and other settings) could just as easily have been reviewed (and adjusted if necessary) before you took the picture. But if you forgot to do so, here’s an opportunity to notice that you had a setting that wasn’t optimal for your conditions and easily retake the shot without waiting until after seeing how crappy the image looks on your computer monitor. Number 6 (white balance) – Look at the photo you just took. Do the colors look right? If not, check your white balance setting. Go back to shooting mode, change your white balance, re-frame your subject and try again. Click here for information about setting custom white balance. 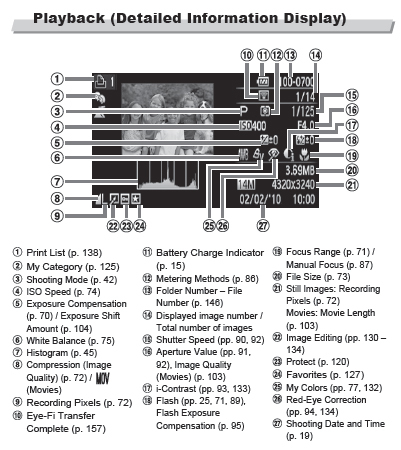 Number 7 (histogram) – Click here for a lesson on how to read a histogram. Not every camera has the same features, but I’d bet that most have a lot of information that you haven’t yet taken advantage of. So dig that user manual out from under the La-Z-Boy and start learning!